Mahindra’s goofy-but-fun-looking little SUV, the KUV100, was officially released today, and it’s especially notable because it’s the first Mahindra SUV that’s offered with a gasoline engine. That could become very, very important if New Delhi bans diesel, as is being considered. The World Health Organization found New Delhi to have the worst air of any city in 2015, which has led the Supreme Court to ban the registration of any 2-liter or bigger diesel vehicle in the capital city until the end of March. Diesel subsidies are ending as well, so Mahindra really needs to get some petrol-powered SUVs out there. 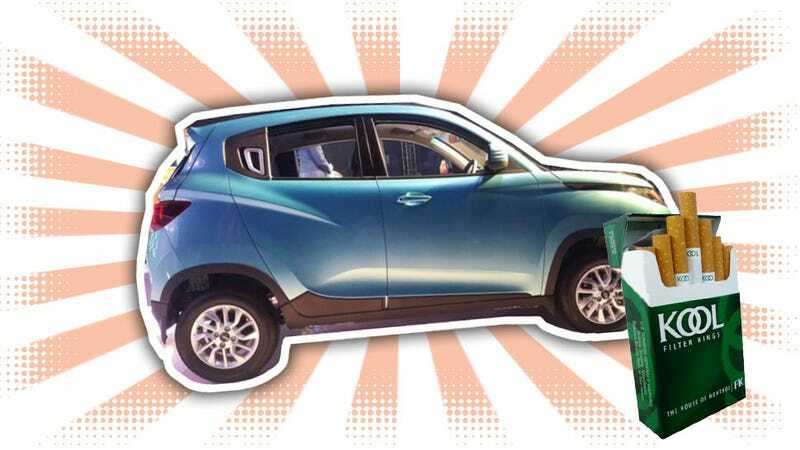 Thanks to our pals over at Indianautosblog, we now have more pics of the KUV100, (the ‘K’ stands for ‘Kool’ which should make you crave that sweet, mentholated taste) and I think it looks pretty fun. It’s got the tall body/small wheels look that’s both antithetical to the usual art school auto-design sketches and yet also a mainstay of cartoon cars, which may account for it’s pleasingly dorky look. Like most Mahindras, it’s heavily styled, and I think the overall effect actually works, as long as you’re not trying to take yourself too seriously. The smaller wheels allow for more interior space in a relatively small package, and true to Indian automotive form, these will probably be loaded well beyond the American-expected capacity, which is why it has a split bench seat up front. That split bench also means the five-speed shifter is mounted in the dash, odd to our eyes but smart if you assume that there will often be a middle passenger in the front there. The gas engine is a 1.2L three making a respectable 82 HP, and the diesel option is the same size, making 77 HP. Even with those small wheels, it makes 6.7 inches of ground clearance, and if it’s like most Mahindras, it’ll have no problem getting around pretty rough terrain. I like this thing. It reminds me of a segment of car lost to the US, the cheap, small, manual, fun off-roader, like the Suzuki Samurai, Geo Trakker, or the first gen RAV4s, before they got all fat and lazy and never call us anymore. The price of the KUV100 starts at about $6500 US, which is absurdly cheap, and goes up to about $10,000, which is still dirt cheap. I can’t really imagine that Mahindra will start trying to federalize these and sell them here, but just seeing it makes me wish this was still a viable segment in America.